When is legal or improper to take a photograph of a stranger? Our discussion began with Arne Svenson, who literally photographed into his neighbors' windows and captured them without their knowledge. It was apparently legal, but was it ethical? PetaPixel reports on Arne Svenson's photography project. To delete or not to delete. Eric Kim tells the story of a street photography subject who became angry when he realized he'd been photographed. He almost got violent and demanded Kim delete the images. Kim refused because he had done nothing wrong and thought the photos were interesting. Several commenters took him to task. What would you have done? Humans of New York posted a controversial story about a clergyman and a woman who claimed he propositioned her. It caused quite a stir. What do you think of that decision? When is it okay to profit from someone's likeness? When do you need a model release? PDN's guide might be helpful. 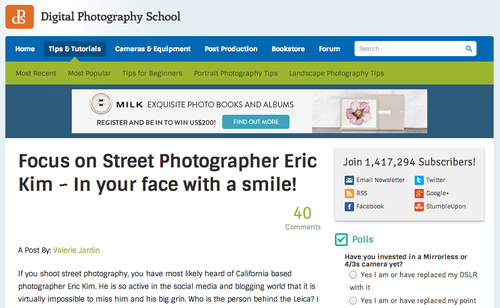 Have you had an ethical dilemma while you were shooting street photography? Tell me about it in the comments. Get more articles like this delivered to your inbox.